What do you need for developing Android apps on Windows? 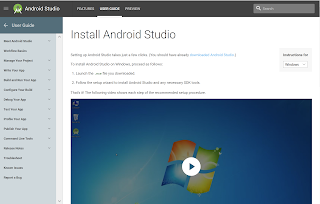 First of all you need Android Studio and for Windows you can download Android Studio 3.0 here. Of course you need to accept the license terms. Once you download the file you will be taken to the installing directions page here. Run the downloaded executable and follow the wizard. I signed up and this is where I landed. It is an untitled project. The file icon brings this up. You can type over Untitled with a name of your own and click Save. Let us see what Publish would do. Click Publish. Very fast, no fuss. That's great. Look forward to more on Thimble at this site. Get Thimble to design your web pages now! It is from Mozilla.org. It is free and has many cool features. It's Remix mode allows you easily modify existing Thimble projects to suit your requirements. Thimble is a one-stop program bundling code editor, web server, web browser and developer tools. It has an unbelievable number of cool features. Sure, I will test drive it! 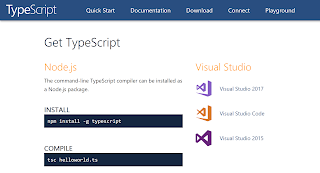 Please read the post about downloading the latest Typescript here. 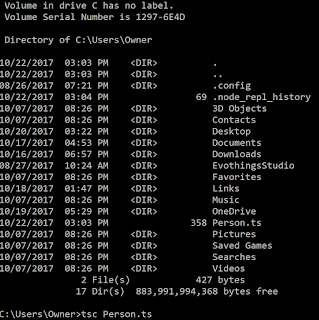 Once you have downloaded Typescript file, you can compile it using the command tsc from the C:\ prompt.
" and I'm " + this.age + " years old!" Save it to a location of your choice as shown. You can download TypeScript2.5 right now. You can download the command-line TypeScript compiler as a Node.js package. It is supported in more programs including Visual Studio 2017 and Visual Studio 2015. Your environment has been set up for using Node.js 6.11.1 (x64) and npm. One way to download Node.js is described here (http://hodentek.blogspot.com/2016/05/get-nodejs-tools-for-visual-studio.html). How do you use the compiler?